I’m currently typing this from my phone! I decided to give SwiftKey a try since I’ve had to use my phone a lot more lately and the typos that came with it were pretty annoying. No matter which mode I use – the hunt and peck method or the swiping mode – it seems to catch my typos very well and correct it properly. The phone’s default autocorrect wasn’t the greatest at correcting and I would send out a lot of errors. SwiftKey is also great at being smart with punctuations. If you type a sentence and put a space before adding the punctuation, it will automatically place the punctuation mark in the proper location. You can also edit any word you’ve typed in your previous text by just tapping on it, and it will give some suggestions. Less typos would make it more appealing for me to use my phone more for typing, like blogging more using the mobile app for example. And the reason why I’ve had to use my phone a lot more lately is only because my dad has been trying to fix the power along my brother’s area of our house because about a month ago the power supply fried alongside his room. Whenever my dad tries to fix it, he has to turn off the power, which connects to our router and renders us Internet-less for however long my dad decides to tinker with the power. Sometimes he’s gone at it from when he gets home from work until 2am (by the way it has been almost a month now and it doesn’t look like they’ve been able to fix it). In that time I just end up using my phone, which made me realize how cumbersome typing on a touchscreen can be a lot of the time. Still trying to figure out if I want to try the hunt and peck method or the swipe method. I can’t tell if I’m better at one or the other. 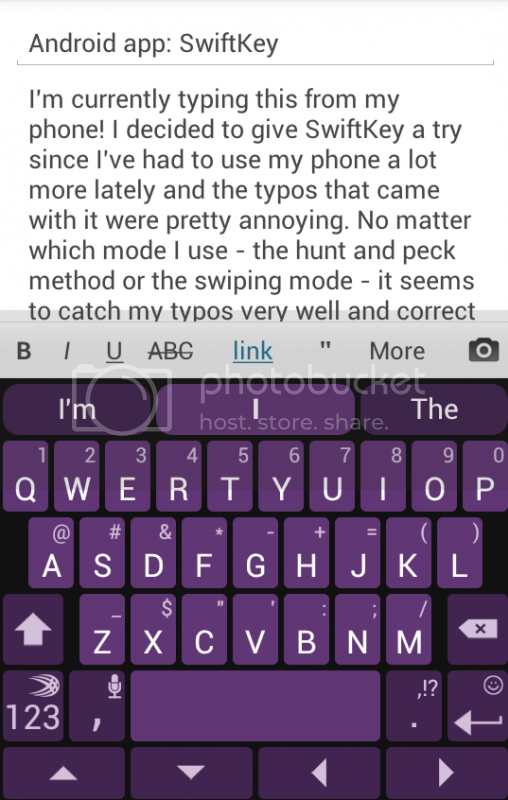 For the hunt and peck method, I actually don’t need to look at my thumbs anymore if I use SwiftKey! Its autocorrect is super good so I can just type away without looking at the keyboard, which kind of makes typing less of a hassle and brings back memories of when I never had to look at my keyboard on my slider phone. For the swiping method it’s super cool to be able to type with just using one finger. If you get used to the gestures, I can see how you wouldn’t have to look at the keyboard much either and it is pretty fast one you get used to it. I feel like the swipe method leaves me with more typos though. I suppose I’ll just keep switching between the two and see which one is best for me.